Learn how threat-focused Next Generation Firewalls have become the industries most advanced network protection available. Don’t compromise (with) your network! What is a Threat Based Next-Generation Firewall? A Next-Generation Firewall analyzes each individual packet coming into the network, compares them to a database of threats and evaluates the danger level based on the security shortcomings of each individual application and endpoint in the network. These functions are managed by a single, unified, browser-based management platform with the capabilities to seamlessly integrate other security functions. With a breach detection rate of 100%, the Cisco NGFW leads the industry for the third year in a row. Lower your average time to detection from months to a handful of hours and reduce the impact of potentially expensive breaches. Simplify security management operations by consolidating all your security functions into a single unified dashboard. Use powerful analytics to easily identify vulnerabilities and seamlessly enact and manage access policy. All of your next generation security functions, managed from a single pane of glass. Your Free PDF is on the way, check your inbox for our email. Today’s technology landscape is complex and disruptive. As organizations become more digital, security has to be more than a department or set of loosely-integrated solutions to keep up. It has to be a total philosophy, worked into everything from product design to development and deployment. Start to finish. End to end. With this focus, Secure Data integrates critical innovations in networking software into one multi-layered architecture. These innovations let you rapidly detect and contain threats, control network access, enforce security policies, and help meet compliance requirements. As cyber threats continue to evolve, it becomes increasingly important to protect yourself against attacks. With Next-Generation Firewalls from Secure Data Technologies, you ensure detection of malware, exploits, and evasions. With our Next Generation Firewall Comparison you can ensure that your network, communications and data are safe from exploits. 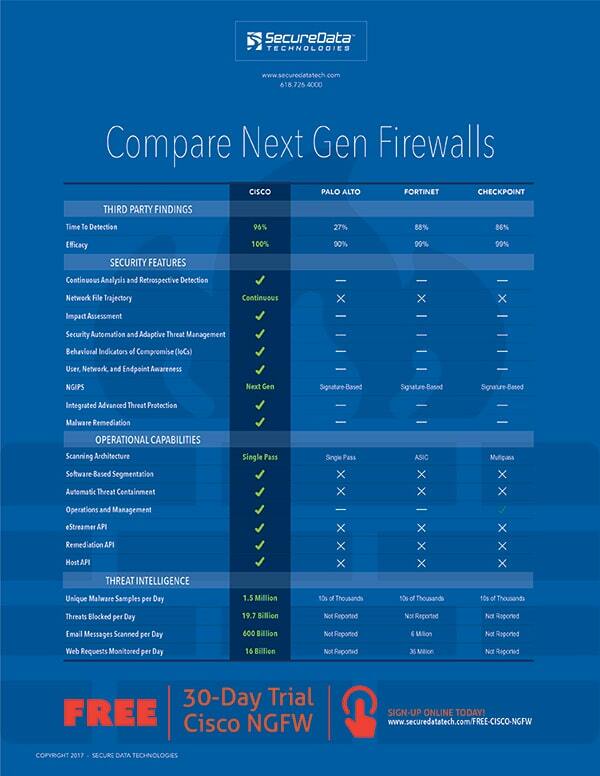 When comparing Next Generation Firewalls it is paramount to consider breach detection rates. Fortunately, the third party NSS Labs – a trusted name for advancing transparency and accountability within the cybersecurity industry – reported a breach detection rate of 100% for Cisco’s threat-focused NGFW. This rating was significantly higher than any other security appliance on the market. Where traditional firewalls just barricade entrances into the network, Cisco’s threat-focused NGFW identifies the vulnerabilities in your network, evaluates the capabilities of intruders and creates a unique, proactive strategy to handle each potential threat and keep your network secure. As the St. Louis region’s premier service provider, we offer comprehensive programs, services and solutions, which blanket your entire enterprise infrastructure. Built on human relationships and continuous, proactive, consultative engagements, our clients can fully customize any program to their exact requirements, technologies and service level agreements.